I suppose, if I have to work for a living there are worse places. West London is a pleasant little town on Cape Cod, lively enough in the summer, but I hate to think what a backwater it must be in winter. Still, I hope to be on my way come winter. The Sherlock Holmes Bookshop and Emporium is sorta interesting. I learned a lot about The Great Detective from my dad, who was an absolute fanatic, so I could pretend to be interested at my job interview. Who would have thought you could stock an entire store with nothing but All Sherlock, All the Time. Not only the original books by Sir Arthur Conan Doyle, but non-fiction about his life and times, new pastiche novels and short story collections, and all the stuff that goes with it. Playing cards, tea-sets, action figures, games, puzzles, cardboard cut-outs, DVDs. The list is endless. There’s even a fake-marble bust of some old time actor playing Holmes. Plus a whole shelf of what the store calls Gaslight, meaning books set in the late Victorian and early Edwardian eras. The job’s okay. Not too difficult, pleasant enough customers by and large. And I get a staff discount at Mrs. Hudson’s Tea Room next door. So, not too difficult. Except for her. The boss, Gemma Doyle. Not that she’s mean or anything. She’s nice enough. She just seems to have this way of knowing things. I mean, she keeps track of the entire inventory of the shop in her mind. “I’m going to have to reorder The Beekeeper’s Apprentice,” I said to Ruby. “I see you had a rush on it. As well as four of the boxed sets of the complete canon. And that hideous Robert Downey Jr. puzzle moved at long last. Nice to see the Jeremy Brett poster was sold, and three sets of playing cards and two of that Scotland Yard game.” The game didn’t actually have anything to do with Sherlock, but we pretended it did. “Most people these days keep their inventory on the computer,” Ruby said. “The computer is a functioning backup,” I admitted. I swear, sometimes I think she’s reading my mind. And that will never do. 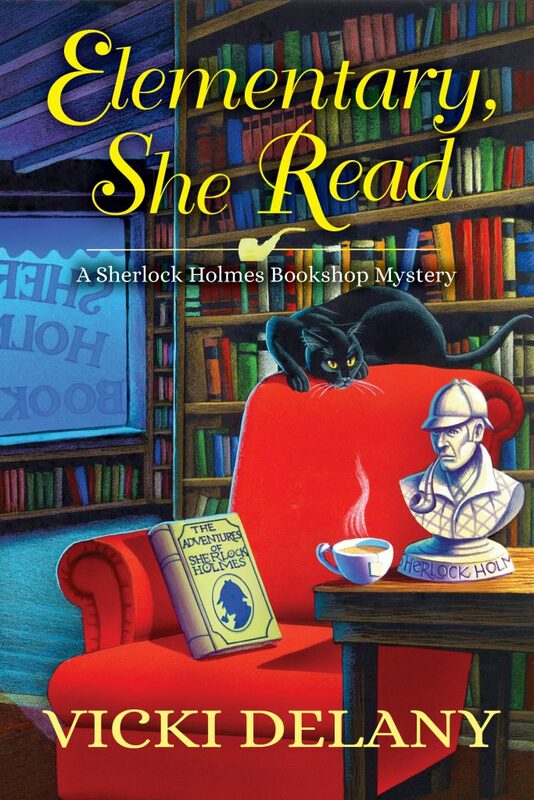 Meet Gemma Doyle, Jayne Wilson, and all the gang in the new Sherlock Holmes Bookshop series by Vicki Delany. The first book in the series, Elementary She Read, will be released on March 14 by Crooked Lane Books. To get you in the mood for a visit to Cape Cod, Vicki is offering a prize pack consisting of a New England cookbook, a magnet showing Moriarty, the shop cat, at the beach, and an Elementary She Read Fridge Magnet. Leave a comment to enter! US and Canada entries. Contest closes, February 20. Sherlock Holmes in one of my favorite characters. I shall have to explore these. Another great book from Vicki can't wait to read it. Thanks. I love Sherlock. I own a small collection of the Basil Rathbone movies on dvd. I am even enjoying the BBC version and the one on CBS. The differences in the settings and story lines are truly fun to compare. I'm a fan of Vicki's writing and own books from her other series. I'd also be thrilled to win this giveaway. What a fun prize pkg! I'd love to win! That's my idea of a bookstore! Wouldn't it be great if we could have an entire store devoted to each of our favorite authors? I love Sherlock and enjoy the old movies at time. So different from the current series. And nice to see so many books now with that theme. Marvelous giveaway, thanks! This sounds like my kind of book. Thanks! The shop would be a wonderful place to work. All Sherlock All The Time.....wonderful premise. What a fun book to read. The cookbook would be a treat to have. Love Sherlock. Love cozies. Love female sleuths! Loved the excerpt and I like the bookshop on Cape Cod setting. Really looking forward to reading. How awesome! Would love to win. Can't wait to read the book, a nice snuggle under the covers read. Looking forward to reading this book! Sounds so interesting! Donamaekutska7@gmail.com really need it! Thanks for the chance! Congratulations Vicki on the debut of your newest series! Love your writings! Congratulations on the new series! I'm looking forward to reading it. kim7corn(at)gmail(dot)com. Congratulations Kimberley, you win! Please send me your postal address so I can put your prize in the mail. Awesome! Thanks for sharing your new book!Elementary she reads! Looking forward to reading the new series. I love me some Sherlock Holmes! I would love to read this book. It sounds really fun. Sounds just wonderful! The patrons at my library love their cozies!